Batman ... laughing? Putting his feet up? This is a strange image to most of us, even though Batman's spent nearly as much of his time as the fearsome Dark Knight as he has the man who slaps Robin on the back and calls him "chum." And even as Grant Morrison muses in prose on the new era of the Joker in Batman and Son, he also helps introduce a new era of the Batman, one where Batman worries whether Robin knows that Batman is proud of him, and where Batman, in Paul Dini's Batman: Detective, does sit back and put his feet up once in a while. In the wake of DC's Infinite Crisis, we're met with a kinder, gentler Batman, one far different than most post-Crisis on Infinite Earths DC Comics readers are used to. And yet, it's not as though the "grim and gritty" Batman was uniquely a Crisis-retcon, now reversed by Infinite Crisis; I recently read Mike Barr's Son of the Demon, and there we find a Batman who's friends with the Gotham police, concerned about the victims as well as the criminals, and ready to marry and start a family when the opportunity arises. All of this in 1987, a firm year after Crisis on Infinite Earths. We know that Frank Miller's Dark Knight Returns likely sparked much of the pre-Infinite Crisis era's dark portrayal of Batman; still another early was the necessary darkening of Batman after the death of Jason Todd. 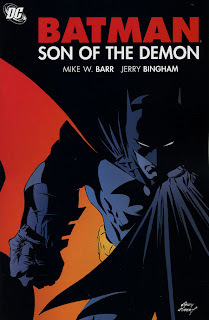 In that instance, however, Batman's darkness had a story purpose; in comparison, Mark Waid's JLA storyline "Tower of Babel," where Batman's secret files on other JLA members fall in the hands of Ra's al Ghul, seems a darkening of Batman to force a story, instead of to tell one. A good story, but when you think about it, not necessarily good for the growth of the character. Interestingly, I note a struggle throughout much of the recent portrayal of Batman against this grim and grittiness, even as the result was a Batman so arrogant he became a parody of himself. Consider Knightfall, for instance, where Batman's decision in the end was to walk in the sun for a while. In No Man's Land, too, Batman learns he has to rely more on his partners; the Bruce Wayne: Murderer/Fugitive and War Games storylines taught him much the same thing. But even as the writers made these attempts to "lighten" Batman, the result was still the dark Batman that began Infinite Crisis. The new, lighter Batman was inevitable, given how far the pendulum had swung toward a dark Batman before Infinite Crisis; the character was almost unreadable. My concern for this new Batman is reflected in Robin: Teenage Wasteland (review to come), where Batman offers to delay going out on patrol in order to talk to Robin about how he's feeling; Batman could very well become too kind and gentle, a "whiny" Batman akin to a similar charge leveled against Superman just before Infinite Crisis. And while Batman-as-father-figure is a perfectly precedented take on Batman, I feel it never tends to last -- the George Clooney Batman inevitably sheds his partners and becomes Christian Bale. But who knows -- if DC can keep the core Batman-Robin-Alfred-Commisioner Gordon dynamic, without loading things up too far with Huntress, Oracle, and the like, maybe we can have our emo Batman and our loner Batman, too. This is all, of course, cut from the same cloth as the new, lighter Johns-ian take on the DC Universe that we've discussed here before -- a slightly happier Batman, one who enjoys being a vigilante, is right in line with a more confident Superman, a friendlier Justice League, and a Justice Society of costumed heroes who rush out to fight costumed villains -- in short, a comic book universe more interested in telling good super-hero stories than in meta-interpreting the heroes' motivations. The danger is that the DC Universe will become too simplistic, though with Final Crisis on the rise, this hardly seems the case; moreover, what I think we see here the death of irony in the DC Universe, in favor of more straightforward super-heroics. Once upon a time, I might have thought this was too short-sighted a goal for comic books, but I've been impressed overall with the post-Infinite Crisis DCU, and I'm willing to believe that simpler might be better. And certainly this has more to do with than just comic books -- as the economy continues to be a worry and war proceeds overseas, it's no wonder our comic books reflect a simpler base, even if the plotlines are more mature. What do you think of the kinder, gentler post-Infinite Crisis Batman? Look for more thoughts on DC's New Earth, probably around when we start to get back into Superman collections. New reviews on Monday; thanks for reading! I think it's definitely time for a change. The DKR-type Batman had its time, but it's gotten to the point of self-parody as you said. Some do it well (Broken City), but most don't. After 20-odd years of a Batman who gives people crap for no good reason, it's nice to see a Wayne who lightened up a bit. It all seems so cyclical. I wonder if we'll see a return to Jerk Batman in another 20 years. Jeffrey -- Well put as always. I agree that it looks like the Silver Age all around at DC, from Batman to Superman to the new, chummy Justice League. And I don't mind it, necessarily, but it's an interesting trend. I liked the early Byrne Superman issues; got 'em all, though they're faded by now. I've been thinking about picking up those Byrne Superman trades; haven't bought them since I have the issues, but re-reading the stories in chronological-ish orders across a few volumes sounds very appealing. I'm wondering if they'll stop after about the Superman #22 point, or how long they'll keep going. Johnny -- Thanks for stopping by! Feel free to pick a review of a trade you've read, and let us know what you think!